It started in Manhattan in 1870 when a few Masons were sharing a drink at their favorite tavern. They felt that Masonry, which traces its roots to stonemasons and craftsmen of the Middle Ages, was a bit too focused on ritual. Instead, they wanted a fraternity that stressed fun and fellowship—not to replace Masonry, but to add to it. They came up with the idea for their look and language (fez, scimitar etc.) after attending a party thrown by an Arabian diplomat. The first chapter, Mecca Shriners, met in New York City in 1872. Membership grew, spreading across the US, and by the early 1900’s, into Canada, Mexico and Panama. Today there are approximately 309,000 Shriners throughout the U.S., Canada, Germany, Mexico, Philippines, Puerto Rico and Panama. Locally, Gizeh Shriners of BC-Yukon started in Victoria, on June 11, 1902, and now represents the largest geographical jurisdiction in the Shriners organization. In 1942, Gizeh headquarters moved from Victoria to Vancouver, and to Burnaby in 1968. There are now over 80 clubs and units affiliated with Gizeh throughout BC and Yukon. Shriners International is a spin-off from Freemasonry which dates back hundreds of years to a time when stonemasons and other craftsmen gathered after work in shelter houses or lodges. Over time, the members organized into Masonic guilds and the tools of their trade—the square and compass—became the symbol of their brotherhood. Masonry evolved to accept members who were not craftsmen, and today, Masonry is built upon a foundation of improving character and strengthening communities, though the square and compass are still the symbols of the fraternal brotherhood. When Shriners International was first founded in 1872, the organization built on the principles that guided Freemasonry, while adding an element of fun and philanthropy that set Shriners apart. Members of the Masonic lodges are required to learn about their fraternity and earn a series of Masonic degrees. When a member completes the third and final degree, he becomes a Master Mason and is then eligible to become a Shriner. Additional courses of Masonic study, the Scottish Rite and the York Rite, are also available to pursue. 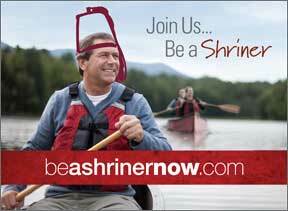 To learn more about how to become a Mason and a Shriner visit www.beashrinernow.com. Freemasonry is inextricably interwoven with the history of British Columbia. The first Masonic Lodge in British Columbia, (Victoria-Columbia) was established in Victoria in 1860 in what was then known as the Colony of Vancouver Island. The second, but first on the mainland, Union Lodge, was established in 1861 at New Westminster in the new Colony of British Columbia. Freemasonry is the oldest, largest and most widely known fraternity in the world, but is also one of the most misunderstood. It is anything but sinister or secret, and there are many publications on the subject. The only mystery is its origin. Some believe Freemasonry began as far back as the Crusades, since there are certainly Eastern influences. However, it is more generally accepted that its origins date back to the stonemasons who built the cathedrals and other great buildings in the Middle Ages. The actual practices and procedures, observed worldwide, were formalized with the establishment of the Grand Lodge of England in 1717.